The choice of engagement ring setting is extremely important. It’s the first decision you should make in the process as it will determine to some extent what kind of diamond you’ll need to buy. To make matters worse, as you can see below, there are such a large number of different styles of engagement ring settings that it can simply get overwhelming. To help you figure out what you want, it’s useful to take a look at recently purchased engagement rings. 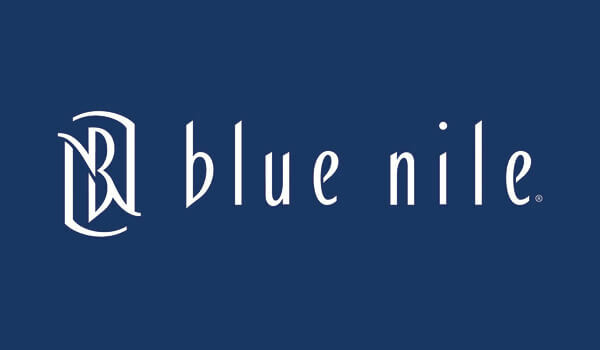 Blue Nile and James Allen both have galleries for this purpose. Have the different styles of ring settings got you all confused? Looking for a simple explanation of terms like halo, pave, and prong? Well, we decided to write this article for you because we know that the world of diamond jewelry can be daunting. Whether it’s an engagement ring and your first-time diamond purchase, or simply a gift for a loved one, we present to you our guide to ring settings, complete with definitions and photos for each term. Once you settled on the right setting, contact us and we’ll be happy to pick the perfect diamond for you. 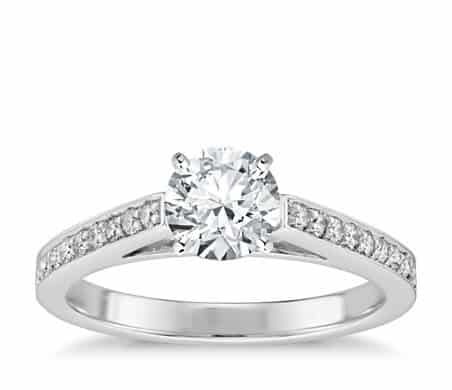 The most common and classic ring setting is called a prong setting. A prong is a little metal claw that grips the diamond tightly, holding it in place. Prongs can be rounded, pointed, flat, or V-shaped (the latter being the most common for princess-cut diamonds). Most prong settings feature either four or six prongs; with the former you can see more of the diamond, but the latter is more secure. A benefit of this setting is that there is a minimum presence of metal, so that there’s more diamond to see and more light that can pass through the diamond, thus adding to its brilliance. 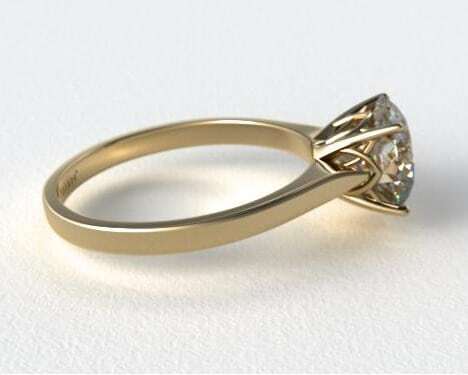 Of the prong settings, the most common is the solitaire setting featuring one diamond or other precious stone. The solitaire setting draws all of our attention to the stone with little to distract us like other stones or fancy metalwork. In 1886, Tiffany & Co. scientifically developed a specific solitaire six-prong setting to maximize the light return on the diamond. This plain-band setting has come to be known as “the Tiffany setting,” distinguished primarily by the “knife edge” of its shaft and the design of its prongs. 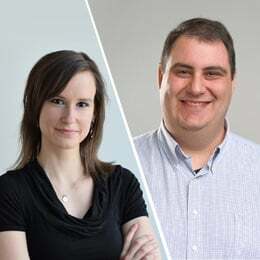 While it is possible to obtain a similar setting at virtually any jewelry shop or website today, it will never be an exact Tiffany setting because Tiffany has trademarked their prong design. The bezel setting is the second most popular ring setting due to its modern look and suitability for an active lifestyle. Instead of holding the diamond with prongs, the bezel setting encircles the diamond, or center stone, with a thin metal rim custom-made to hold the stone tightly in place. A bezel setting can be a full or partial setting: a full bezel completely surrounds the diamond whereas a partial bezel leaves the sides open. It’s a great choice for nurses, teachers, and others looking for a ring that won’t snag and will adequately protect the diamond. 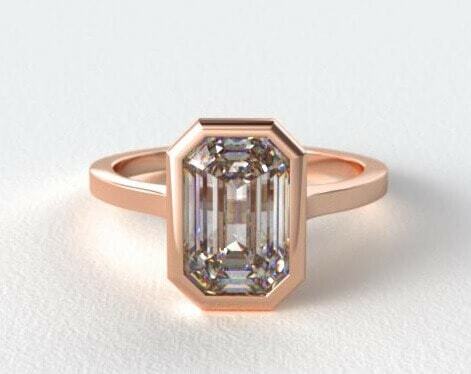 In the picture below, the emerald-cut diamond is bezel-set in rose gold. 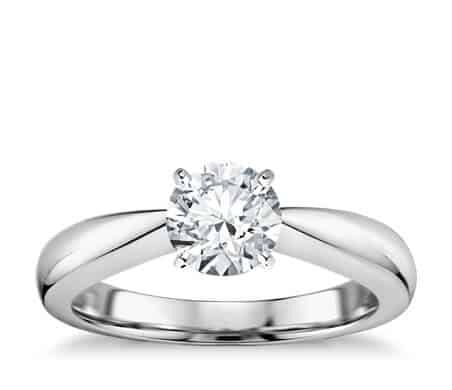 The tension setting is named for the tension of the metal band that secures the diamond in place; the result is that the diamond appears suspended between the two sides of the shank. 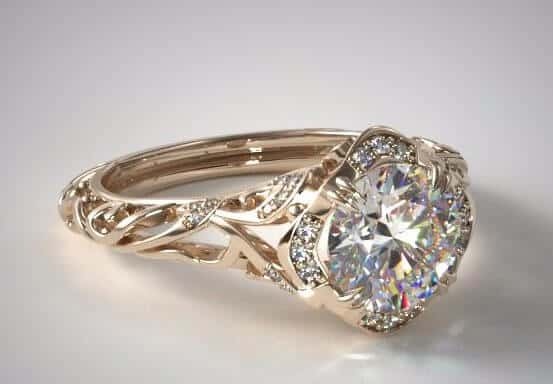 With the help of lasers used to calibrate the exact dimensions of the diamond, the jeweler expertly cuts tiny grooves into the sides of the band, or shank, so that the diamond, or other precious stone, is literally held by the pressure of the custom-designed metal band pushing into the sides of the stone. Tension-style settings feature a comparable look of diamond suspension but are less expensive and complicated to make. The tension-style settings add an extra dose of security since they employ a prong or bezel setting on the side or underneath the diamond to anchor the diamond firmly in place. A popular engagement ring style is to mimic a tension style setting (like you see above), but in fact the diamond or gemstone is set in the band, typically as a bezel setting. 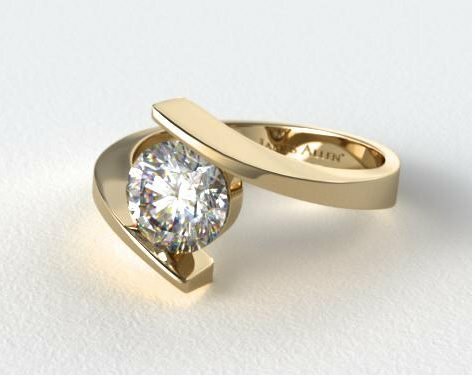 In the two photos below, the one on top (two-tone metal with pear shape diamond) is a classic tension setting while the one underneath is a tension-style setting. Notice the bezel setting around the round diamond in the tension-style setting. The channel setting is a secure way to set smaller diamonds in a row into the band of the ring, making a metal channel of sparkling stones flush with the shank. The diamonds, or other gemstones, are set closely together into the grooves of the channel and decorate the sides of the band or the entire band. 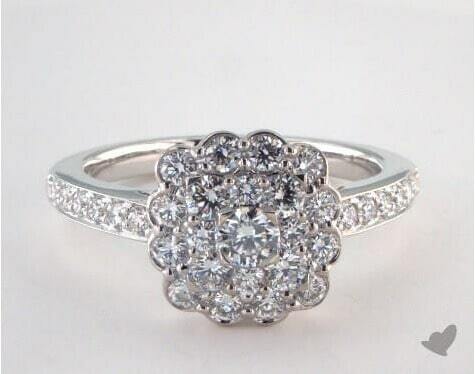 This setting is also popular for wedding bands or stackable rings that feature only smaller stones and no center stone. Since there are no prongs, this setting is also a good option for a snag-free and secure design. In the photo below, the diamonds in the shank are channel-set. The pavé setting, pronounced “pa-vay,” comes from the French word “to pave,” as in paved with diamonds. By closely setting small diamonds together with minimal visibility of the tiny metal beads or prongs holding the stones in place, the effect is one of continuous sparkle. The jeweler typically drills holes into the ring, carefully places the diamonds into the holes, and finally forms tiny beads, or mini-prongs, around each diamond to secure them into the holes. This setting is also known as a bead setting and in the case of especially small stones, may be called a micro-pavé setting. Diamonds are said to be pavé-set when they are as small as .01-.02 carats and any smaller than that would be called micro-pavé. We recommend confirming ring size early in the design process in order to prevent any problems with fit when the ring is finished. The halo setting refers to the placement of diamonds or other gemstones in a concentric circle or square around a center stone. The halo setting makes the center stone appear larger—a great option to boost the appearance of a small diamond—and it increases the overall sparkle of the ring. A halo setting, then, can be a way to save money on a smaller-carat diamond while not sacrificing the overall appearance of the ring. In addition, adding a halo of colored gemstones or setting the halo diamonds with a different color metal can make for a contrast in colors. 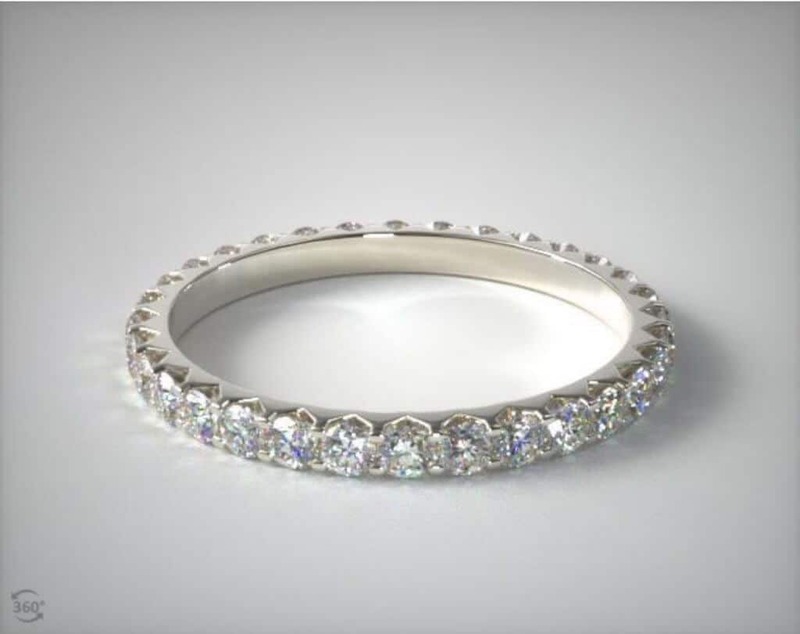 Halos are often paired with pavé bands (see example below) but could certainly stand on their own with a simple unadorned band. And as the name implies, a double halo setting consists of two concentric circles of gemstones that encircle the center stone. The cathedral setting is one of the most elegant and classic engagement ring settings. Similar to the graceful arches of a cathedral, this ring setting uses arches of metal to hold the diamond or other gemstone. The cathedral may be set with prongs, bezel or tension setting since the defining characteristic of this ring is not how the diamond is held but rather how it is mounted with arches above the rest of the shank. The arches can add extra height and make the center stone appear larger; they can also add cost-saving style for less money than adding more diamonds. 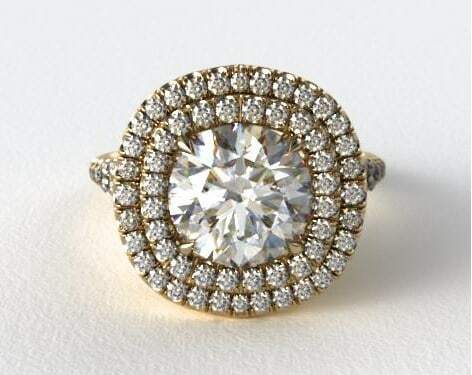 A flush setting, also known as a gypsy setting, sets the diamond into a drilled hole in the band of the ring so that the ring sits “flush” with the band of the ring. Then the jeweler hammers the metal around the diamond to hold it in place. Because the jeweler must hammer in this piece of metal to hold the stone in place, this setting is not suitable for softer stones, which could crack in the process. 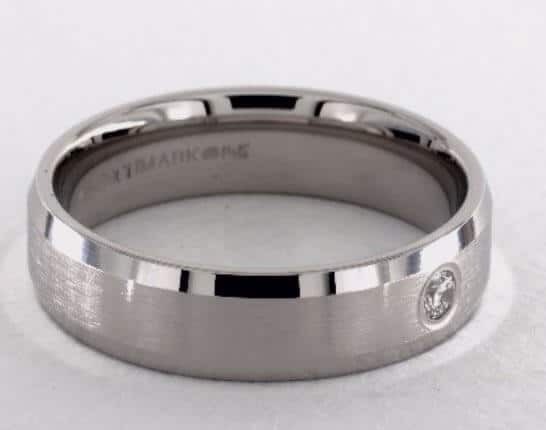 This type of setting is a popular choice for wedding bands, especially men’s wedding bands, as the diamond sits securely in the band of the ring and is therefore highly protected from chipping or falling out. The three-stone setting is a versatile setting that can be used for engagement, anniversary, or any occasion. The three stones, set closely together, are said to symbolize the couple’s past, present, and future. These stones can either be all the same size or, as is often the case, the center stone is larger than the two side stones. 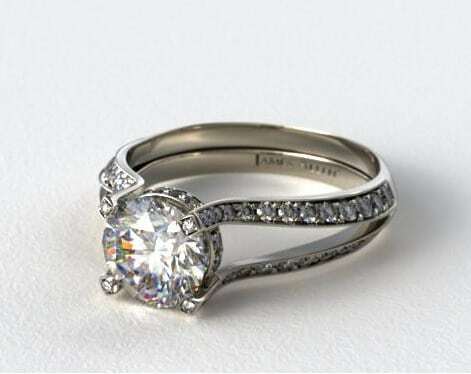 The most popular diamond shapes for this setting are the round brilliant cut and the princess cut. 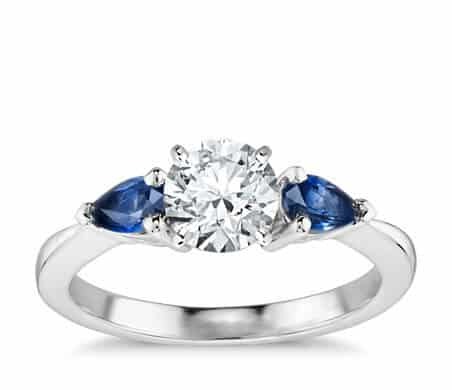 It’s possible to personalize this setting with colored sidestones, such as sapphires, rubies, emeralds (see photo below), or other birthstones. Many of the antique/vintage styles are designed to fit specific time periods of jewelry fashion, such as Art Deco, Edwardian and Victorian era styles. Often these rings feature intricate detail work such as filigree and milgrain. Filigree is a kind of delicate metalwork that solders together tiny metal beads or twisted threads of metal to the surface of the jewel. And milgrain engraving is a type of embellishment added to antique style rings to give them that “antique” look of tiny balls of metal decorating the sides of the band and the crown of the ring. Check out the photo below of an antique style setting with tiny yellow gold milgrain embellishments around the bezel-set round brilliant diamond and repeated all over the shank. A cluster setting “clusters” stones tightly together in order to look like a large diamond. It can either contain a larger center stone or cluster together stones of equal size. 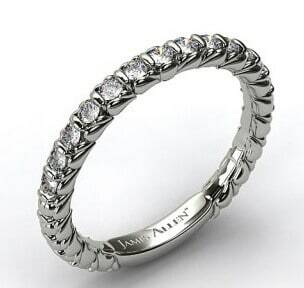 Eternity bands are not a particular kind of setting per se; rather they are a style of band that is often used for women’s wedding bands or other special occasions such as anniversaries, birthdays and Valentine’s Day. These bands get their name from the “eternal” presence of diamonds or other precious stones that decorate the entire band of the ring. Eternity rings are available in prong, channel, bezel and flush settings. Here’s another term you may heard thrown around by jewelers. The shank refers to the band of the ring or the part that actually encircles your finger. Most shanks are round, but there are also square shaped-shanks and other more creative shapes. A split-shank refers to a ring in which the shank splits into two separate shanks. See the example below of this pave-set split-shank band. Your ring setting is the foundation of your entire ring design. 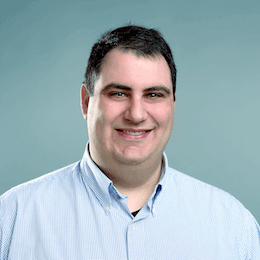 Selection largely depends on personal style and preference—along with the wearer’s lifestyle. Some settings lend better to active folks or those who do work with their hands, while other designs are more intricate with high-set stones. Consider also how often the ring will realistically be cleaned and maintained, as some settings require more upkeep than others. And be sure to consult our ring size guide if you are concerned about finding the right size for your ring. Once you’ve chosen a setting, you’ll want to look for a diamond that complements its style and is well-supported by the setting. If you’re interested in selecting an exquisite diamond for your ring, get in touch with one of our experts who can help you review diamonds and ensure you’re not overpaying.